NFL commissioner says "ample evidence" warrants "significant discipline"
MIAMI, Florida (CNN) -- Suspended Cleveland Browns wide receiver Donte Stallworth walked out of a Miami jail Friday after serving 24 days out of a 30-day sentence for killing a man while driving under the influence of alcohol. 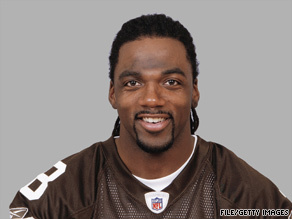 The NFL has not decided how to discipline Donte Stallworth, who killed a man while driving drunk. Stallworth, 28, left the jail in the pre-dawn hours of Friday and got into a waiting car, ignoring reporters' questions for comment. It is unclear why he did not serve his entire sentence. Shortly after he pleaded guilty to DUI manslaughter last month, the National Football League suspended him indefinitely. He will be under house arrest for two years following his release, according to the terms of his plea agreement. He is also required to donate $2,500 to Mothers Against Drunk Driving, serve eight years of probation and submit to random drug and alcohol testing throughout his probation. His driver's license was permanently revoked. Stallworth was driving his black Bentley GT east on the MacArthur Causeway, which connects Miami, Florida, to the South Beach area of Miami Beach, when he struck construction worker Mario Reyes on the morning of March 14, according to prosecutors. Stallworth had been drinking at a Miami Beach club earlier, according to court documents. His blood alcohol level was 0.126 percent, prosecutors said; Florida's legal limit is 0.08. Reyes, 59, reportedly was heading to a bus stop after work when he was struck. Court documents said he suffered "critical head, chest and abdominal injuries" and died at a hospital. When police arrived, Stallworth told them he was the driver of the car and admitted striking Reyes. During the June 16 hearing, Stallworth said he offered his "deepest condolences to the Reyes family." "Though I cannot bring back Mr. Reyes or ease his family's pain, I can and will honor his memory by committing my time, my resources and my voice by educating this community about the dangers of drunk driving," Stallworth said. He reported to jail immediately after the hearing. Stallworth could have served up to 15 years in prison on the charge. But state attorney Katherine Fernandez Rundle said in a statement that he had cooperated with authorities and had no previous criminal record or traffic violations. Reyes' family supported the plea agreement, she said. Stallworth's attorney, Chris Lyons, told CNN sister network HLN last month that Stallworth had reached an amicable financial settlement with Reyes' family, but would not disclose the amount. Lyons said the length of Stallworth's jail term "had nothing to do with Donte Stallworth being a celebrity, a professional football player or money." Stallworth has shown genuine remorse and accepted responsibility for his actions, Lyons said. NFL Commissioner Roger Goodell said that the league would contact Stallworth's attorney to schedule a meeting with him, after which a final determination would be made on discipline. Goodell said that there is "ample evidence to warrant significant discipline" under both the NFL's personal conduct and substance abuse policies. "The conduct reflected in your guilty plea resulted in the tragic loss of life and was inexcusable," Goodell told Stallworth in a letter. "While the criminal justice system has determined the legal consequences of this incident, it is my responsibility as NFL commissioner to determine appropriate league discipline for your actions, which have caused irreparable harm to the victim and his family, your club, your fellow players and the NFL." Goodell notified NFL clubs earlier this year that there would be increased emphasis on addressing driving under the influence and other misconduct, the league said. It noted the NFL offers a "safe rides" program used by most clubs to provide players and other employees with alternative transportation if they have been drinking.